Grew Up… on sharecropping farm in Kentucky. Carl dropped out of school in the seventh grade in order to help his family of farmers, though it was never his dream to be stuck on a farm forever. Living… in Bayonne, New Jersey, where is attending the U.S. Navy’s Diving and Salvage School. After being inspired by Master Chief Petty Officer Billy Sunday’s heroics in the South Pacific, Carl has decided to dedicate his life to diving. Profession… Naval diving student in the midst of intensive training. In the late 1940s, the U.S. Navy is not exactly the most inclusive organization. As an African-American, Carl is facing twice the hardship that a white recruit would – or more. In fact, the commanding officer at the school goes out of his way sabotage Carl. Relationship Status… falling for an aspiring doctor named Jo. The educated Jo, who works part time at a library in Harlem, is helping Carl through his intensive training. Personality… determined, strong, and persistent. Carl wants to become a diver so badly “because they said I couldn’t have it.” He’s out to conquer the bigotry that stands against him and prove everybody wrong. Carl Brashear's popularity ranking on CharacTour is #3765 out of 5,000+ characters. See our top-ranked characters and read their profiles. Against formidable odds -- and an old-school diving instructor embittered by the U.S. Navy's new, less prejudicial policies -- Carl Brashear sets his sights on becoming the Navy's first African-American master diver in this uplifting true story. 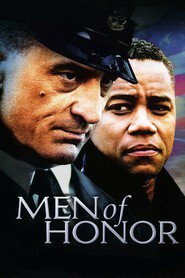 Their relationship starts out on the rocks, but fate ultimately conspires to bring the men together into a setting of mutual respect, triumph and honor.